Following 25 years as a Structural and Civil Engineer in the construction industry, George Voyias formed Ashton Consulting Engineers in November 2007. George has extensive experience in the design of many new buildings in the commercial, educational, health, residential and industrial sectors. He also has great experience in assessment and conservation of existing Listed, historical and modern buildings. Below is general information on the practice and examples of some of the projects George has engineered. The aims of Ashton Consulting Engineers (ACE) are to provide a quality service to clients by ensuring each client’s objectives are defined and realized. ACE strive to give proactive design advice working in close collaboration with the client’s architect and other professional consultants. Careful attention is given to the co-ordination between disciplines to achieve integrated design solutions that are within budget and programme. ACE are able service projects throughout East Anglia as well as north and central London. George has the support of several other engineers and CAD technicians to provide design, drafting and site supervision assistance. George has worked with these engineers and CAD technicians for many years and he has full confidence in their ability and support. In addition ACE have arranged an inter-office agreement with a larger practice to pool staff resources for larger projects. Ashton Consulting Engineers are committed to the aims and standards of the Association of Consulting Engineers. The practice offers professional indemnity insurance cover of £2.0 million as standard for most projects and this can be increased to suit larger projects. 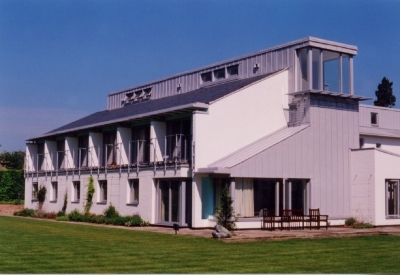 New accommodation buildings were provided for visiting fellows and study bedrooms for students of Clare Hall, a graduate college of Cambridge University. The layout created a new quad against a large house designed by Erskine in the 1960s. The structure consists of steel and timber roof trusses, timber rafters, as well as pre-cast hollow-core floor slabs, supported on load-bearing masonry built on trench-fill, in-situ concrete foundations. The project was awarded a Civic Trust Award in 2003. 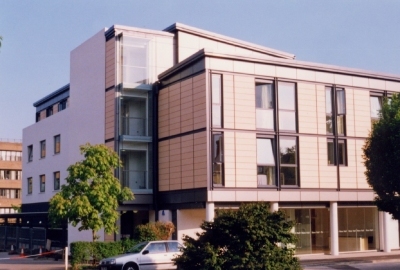 The judges described the scale and relationship of the development to its neighbour as so successful that it added to the quality of the original building. The interiors are bright, colourful and well detailed, with excellent circulation spaces. The sensitively designed scheme has 4000 square metres of floor space, a new junction for access onto the A10 road set in landscaped parkland, a reduced level car park, and a sustainable urban drainage system. The new buildings have prefabricated steelwork frames and precast concrete floor slabs. One new module has piled foundations in Gault Clay, while the other four have conventional concrete pad foundations on chalk. The waveform roof has a structural steel decking infilled with concrete, which is integrated with a "chilled beam" system of air conditioning, heating and lighting. A column free space was achieved at first floor level by steel “bow string” trusses tensioned with stainless steel tie rods. This is one of eight blocks on the site with each block having up to 10 units. 7 of the blocks are complete and the last one is due for completion in the spring of 2008. George Voyias was Project Engineer responsible for the design of all the structural work as well as the roads and drainage. The units have a steel framing with reinforced concrete ground bearing slabs and a composite concrete first floor slab cast on profiled metal decking. 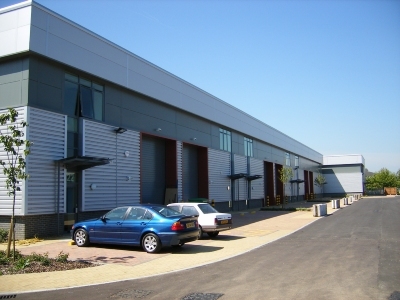 The first floor levels have either a complete floor for office use or a mezzanine floor for both office and storage space. The storage space at first floor has been designed to support an imposed loading of 5.0kN/square metre. This new building for a college of the University of Cambridge has 35 study bedrooms, student common rooms, an auditorium in the basement and two seminar rooms. The biggest design challenge was to allow for the construction of the three-storey building with a basement on a very small site and in a 12 month period. The solution was to prefabricate almost all the main structure as well as the bathrooms. 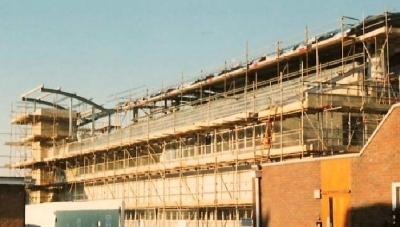 This involved the use of pre-stressed, hollow-core concrete floor slabs, pre-cast concrete columns, pre-cast concrete stair and landing units, prefabricated steelwork girder beams and columns, as well as 35 prefabricated fully fitted and finished bathroom units. The construction cost was £3.1 million and it was completed on time. 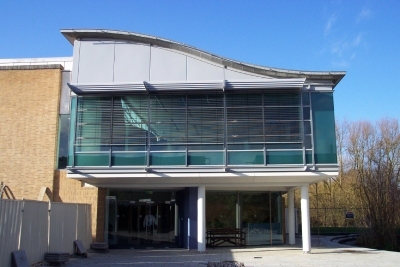 This state-of-the art laboratory building was built as part of a £14million redevelopment project of the research institute. The four storey building has a concrete frame with shear walls to provide a very stiff building to suit the sensitive laboratory equipment. The building was designed to give considerable flexibility in the use of the space to allow for future research demands while aiming to achieving low life-cycle costs. The entire third floor has specialist plant and equipment to service the laboratories. 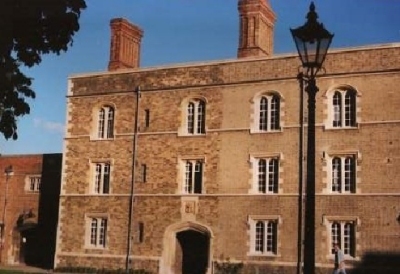 Structural alterations and repairs were designed for several of the Staircase Blocks as well as the conversion of the former library to study bedrooms for this Grade 2 Listed building in the heart of Cambridge. During the works 15th Century load-bearing oak studs were exposed that had rotten bases. The rotten timber was carefully cut out and the stud wall underpinned with engineering brickwork and concrete footings. Other structural repairs included strengthening the timber roofs, brickwork, stonework and beam and pot concrete floors.